Cat Scratching Carpet - How to Stop It? Cat Scratching Carpet – How to Stop It? There it is again- the dreaded noise of the cat scratching carpet. You rush into the room to stop the behavior. You stomp. You yell. You clap your hands. You may even lightly swat the kitty, aka The Shredder, but nothing seems to stop the cat scratching carpet. Carpet isn’t the only victim of The Shredder. You can’t stop cat scratching furniture either! What can you do? How can live in harmony with The Shredder? Cats scratch. It is part of who they are. When cats scratch carpet or furniture, they are marking their territory. Cats have a marking scent in the paws. Cats also scratch to work their muscles. Think of it as feline yoga. But your cat scratching carpet or any of your things is not acceptable to you. Declawing cats is an option, albeit it brutal one. The surgery can be compared to amputating the last little joint of all your fingers and toes. Ouch! It affects their ability to walk and balance. Heaven forbid your declawed cat escapes into the neighborhood. She will be defenseless. There are two approaches to stop your cat scratching carpet or other no-no’s. The first is to make the experience unpleasant and the second is to redirect the cat to something more appropriate. When The Shredder starts scratching in an inappropriate place you can rattle an empty can with some coins in it, clap your hands and speak firmly, or shoot her with a squirt gun. Soon, your cat will associate the inappropriate scratching with unpleasant noises or water. 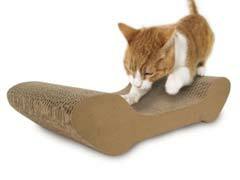 Now you want to redirect your cat’s scratching behavior. At a different time, when you are both calm, rub some catnip on a cat scratching post or cat scratching tree. You can also play “chase the finger” or “chase the string” around the post or tree. It is very important to make sure that the new scratching device has a wide base and is firmly anchored. The last thing want is for your kitty to have a bad experience with the post and be afraid of it forever. With a little love and patience, your cat can scratch to her heart’s content and you can save your carpet and furniture. It’s a “win-win” situation for both of you!